An easy Asian pressure cooker recipe for tender chicken thighs in a soy sauce, honey, lemon juice and garlic sauce. Plus the rice is cooked at the same time and in the same pot as the chicken. Add in some broccoli and you have a complete dinner! Add honey, soy sauce, garlic and lemon juice into the Instant Pot. *Whisk until smooth and combined. Trim the chicken of excess fat. I like to use kitchen shears to do this step. Pat the chicken dry with paper towels. Place the flour in a pie tin or shallow dish. Lightly dredge each of the chicken thighs in the flour covering all surfaces of the chicken. 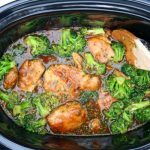 Place each piece of chicken into the Instant Pot. Press to submerge into the sauce. Place the trivet that comes with the Instant Pot with the handles up and the feet down on top of the chicken. Fill a oven safe dish that fits inside your instant pot with the rice. I used a corningware dish* like this. Mine was 1 1/2 quarts. Place it on top of the trivet inside the Instant Pot. Carefully pour the water on top of the rice. When the timer beeps let the pressure release naturally for at least 10 minutes (I did a bit longer than this). Gently move the valve to “venting.” If foam starts coming out then wait for 20 seconds and try again. Once all the pressure is released remove the lid and very carefully remove the rice with hot pads. The bottom of the rice dish will be messy from the sauce of the chicken. I just transferred my rice to a clean bowl. Remove the trivet. Serve the chicken, broccoli and sauce over the rice. Many people have made this recipe successfully, including me. However there have been a handful of people that get the “burned” notification on their Instant Pot. This is probably due to the fact that there is not a lot of liquid in the recipe and the honey is very thick. Make sure to really whisk the mixture good. You may want to double the sauce ingredients or add in a half cup of water to prevent this from happening. I have not tried this recipe with chicken breasts. I imagine it would work but am not totally sure on the cooking time since chicken breasts cook quicker than chicken thighs.